Dulles, VA. April 16, 2015. Reston Limousine, the Washington DC area’s premier transportation operator, is proud to announce that it has received the highest safety rating for the third year in a row from the Department of Defense. “We have put together a rigorous training and safety program at Reston Limousine under the professional direction of Safety and Training Manager Keith Johnson,” Reston Limousine CEO Kristina Bouweiri said. “As a result, the intense audits we undergo every three years by the Department of Defense and Department of Transportation have ranked us ‘outstanding’ in all aspects of our safety performance,” she added. By achieving the DOD’s highest ranking following a February inspection , Reston Limousine is qualified to transport military personnel, as well as to provide transportation services for federal, state, city and county agencies. In addition, Reston Limousine last August also earned the highest safety rating from DOT, which regulates all interstate motor carriers through its Federal Motor Carrier Safety Administration division. General: This section evaluates whether or not the carrier has the necessary knowledge and understanding of Federal Motor Carrier Safety Regulations. Driver: This section determines a motor carrier’s policies and procedures as they relate to qualifying, hiring and training drivers. It also evaluates the carrier’s drug & alcohol policies and testing program as well as the medical standards required to operate a commercial motor vehicle. Operational: This section determines the carrier’s fitness and compliance with federal regulations as they pertain to operating commercial motor vehicles. Vehicles: This section examines a carrier’s vehicle maintenance and inspection process. Accidents: This section addresses the rate of recordable accidents during the previous 12 months. DOD has an additional section, DITMO/Passenger, which evaluates a carrier’s knowledge of and compliance with the guidelines in the Military Bus Agreement. The safety and training program developed by Johnson and the Reston Limousine team is one of the best in the country and the interstate passenger carrier industry. 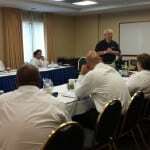 Johnson came to Reston Limousine in 2009 with 25 years in the transportation safety industry. He continues to maintain his certification as a Director of Safety (CDS) through continuing education and maintains his certifications in Defensive Driving (CSI) and Driver Improvement Instruction (CDII). Beginning this year, Reston Limousine offers a comprehensive program, BASICS: Being Audit Safe Isn’t Complicated Seminar© that will focus on the passenger carrier and “train the trainer” to prepare a company for success with a basic DOT audit. Reston Limousine’s DOT safety information can be viewed here. In business since 1990, Reston Limousine is the Washington, D.C., metropolitan area’s premier limousine/shuttle service. With a fleet of more than 200 vehicles, it is ranked No. 13 in the country in operational size for chauffeured transportation operators. Led by President and CEO Kristina Bouweiri, Reston Limousine is nationally certified as a woman-owned business through the Women’s Business Enterprise National Council, and is SWaM-certified by the state of Virginia. For federal clients, Reston Limo is an approved vendor on the GSA Schedule as well as for Department of Defense personnel. Reston Limousine serves the metro area from headquarters in the Dulles corridor and satellite locations in Washington DC; Capitol Heights, MD; and Fairfax, VA. In addition to its government and private shuttle transportation services, the company has set the standard for leisure transportation through its wine and brewery tours; wedding, social, and VIP transportation; and corporate service including Metro bus shuttles. Through an international affiliate network, Reston Limousine can arrange chauffeured transportation services around the world with just one call. For additional information contact Reston Limousine at 703-478-0500 or visit www.restonlimo.com. Tags: Reston Limousine, Safety Certifications, Department of Transportation, Department of Defense, Driver education, Interstate Passenger Carrier, Kristina Bouweiri.